Colin left for Singapore a few days ahead of us. His first flight got turned around and he had to wait until the following day to fly out. The boys and I left on Thursday the 30th of July and with the time travel we arrived in Singapore on Friday the 1st of August. We didn't exist in July 31 except for a few hours. That sort of messes with your mind a little bit when you think about it. The kids were pretty well behaved the whole trip and did OKAY on sleeping too. We flew Alaska Airlines to Seattle then Delta to Tokyo and onto Singapore. Ryan took these photos as we were getting ready to land in Seattle. This is us boarded our second flight. Enroute. Man. That trip across the pacific is LONG. And there are definitely longer flights than the one we took. It's hard to get comfortable enough to sleep. Evan was pretty upset about that. I told him to try and imagine being three times his size! Ha ha ha. 14 of my closest family members and I traveled to California last week for our Clegg Family Reunion. It was a grand-old time if I do say so myself. Our reunion was held at Santee Lakes like last year. This year attendance was pretty low, I'd say less than about 70 people, however we had a great time visiting with all who were able to come. Our time in California is never long enough but since I was only VISITING Utah this summer, it felt especially short. Anyway, here are the photos I took of our trip. This summer has been a lot of fun. I'm so grateful that we were able to come to Utah and be with our family for a little while. I'd like to tell you all how glad I am to have spent time with you this summer. Thank you for the play-dates, lunches, and conversations. I'm sorry our time was limited and we weren't able to see everyone very much; I know your time is precious too. We'll be heading back to Singapore this week and I feel ready to get back into the swing of normal life and routines. I think the boys are excited and ready for school to start too. We anticipate being gone one more year, with a move back to Utah next June... that's the plan for now! Here are some of the things we've been up to this July. 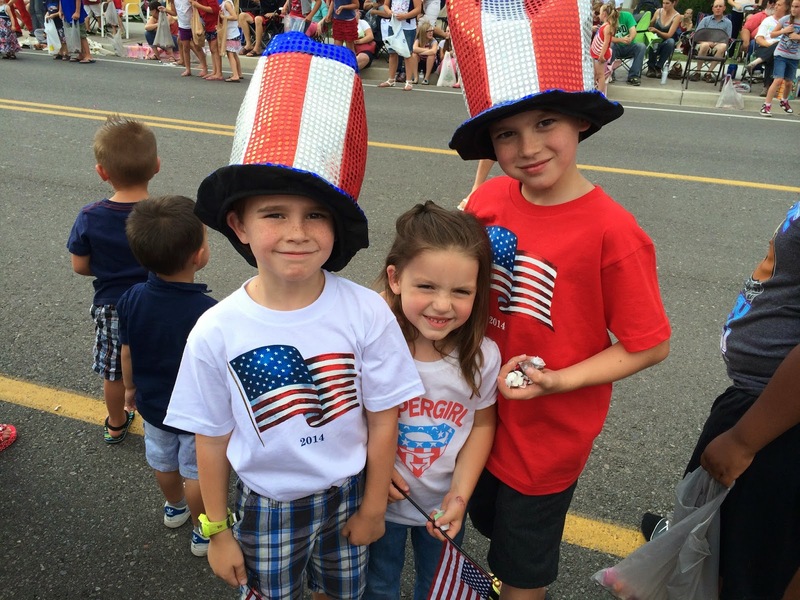 Riverton City had a parade on Friday, July 3rd. Jess, Mom and I took the kids over to watch. It was pretty fun for the kids. I think they thought they'd died and gone to heaven with all of the candy from the floats. We saw a few familiar faces up there too; that was fun! On the morning of the 4th we attended a ward breakfast with my mom. Traditional American breakfast was a great way to start the day! Evan wasn't feeling really well all week and after breakfast he was sick again, poor kid! Later that evening Evan finally started feeling well enough again to go out and we headed over to Lehi to see the fireworks from Thanksgiving Point. We had planned on meeting up with some friends but we didn't want to share our germs. Jax was the cutest about the fireworks. He though they were so cool and kept saying "ooh" and "wow". Ryan said it was his best 4th of July ever. It was a great time of year to be back in America, that's for sure!